In Paris, the palette of Van Gogh is much more light and light than Dutch works. This is clearly seen in this picture, where the artist painted Agostin Segatori, sitting at the table cafe Tambourine. This cafe was located on the boulevard of Clichy, its interior is easily recognized by the peculiar form of tables. Van Gogh and other artists from Cormona’s workshop often went to this institution and even organized exhibitions in it. Several paintings can be seen on the walls behind the heroine’s back. Italian Agostina Segatori was one of the owners of the cafe Tambourine. Presumably, Van Gogh had a short romance with her. In this picture, the artist depicted her in an unusual headdress. A woman sits at one of the tables, folded her arms on the table. The expression of Agostina’s face indicates her meditative calm mood. At the same time, slightly closed wide eyebrows emphasize her strong-willed character. The interior is also made in soft, calm tones. The space of the cafe Van Gogh depicted with the help of light gray-blue tones, which create a light haze behind Agostina. The foreground is brighter and more colorful, which distinguishes it from space and allows you to concentrate the viewer’s attention on the main elements of the composition. 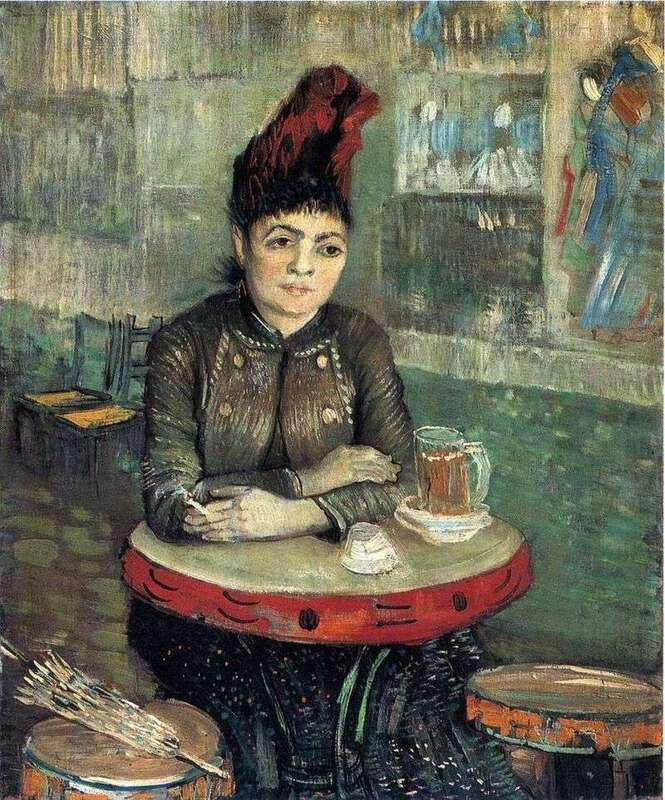 Description and meaning of the painting Agostina Segatori in the cafe Tambourine by Vincent Van Gogh.